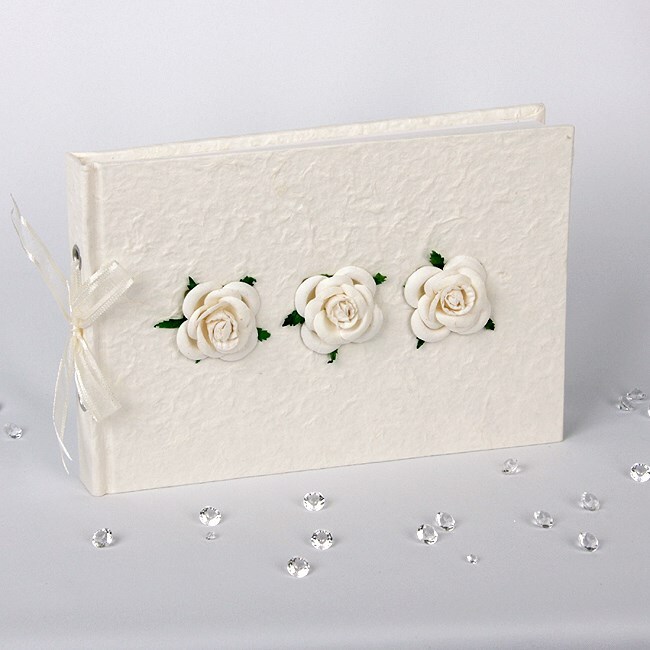 This classic handmade guest book has a textured ivory mulberry paper cover and is decorated on the front with 3 lovely inset handmade paper cream roses. On the spine is a pretty cream organza ribbon tied into a bow Inside are 35 acid free, plain white pages which are perfect for recording all those personal messages on your special day. Why not ask your guests to leave a space next to their message for you to add a photo. It is ideal for weddings, engagements and anniversaries. You can also use this book as a small traditional photo album. Each book is 24 x 16cm in size, cello wrapped and comes in its own presentation box with a clear lid.